In 2016, photojournalist Zoe Meyers and I set out to examine the polluted New River, which flows from Mexicali across the border into California. For years, the river has been plagued by toxic pollutants and raw sewage spills. We wanted to know why — and how the pollution is affecting people who live there. These central questions led to "Poisoned Cities, Deadly Border," a Desert Sun investigation of pollution on the border and its effects on people's health. 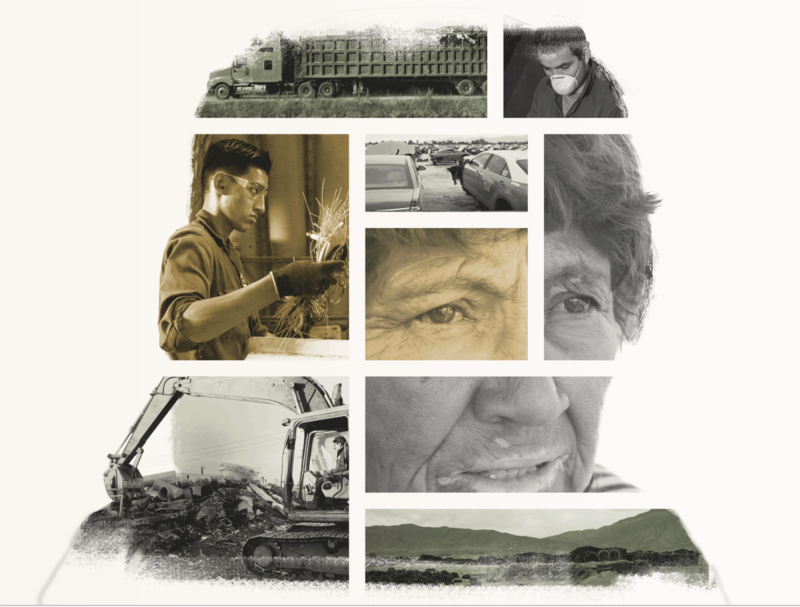 Our reporting revealed that the pollution — in the water, in the air, and all around the region — is linked to the rise of industry in Mexicali, that government regulators are failing to crack down on polluters, and that people on both sides of the border are paying a heavy price. The city has grown rapidly around its maquiladoras, which manufacture products that supply Mexico and the United States. And those factories have contributed significantly to the pollution in the city and along the border. The factories’ smokestacks add to the traffic exhaust, dust, and smoke from trash fires, all of which often leave Mexicali and Calexico blanketed in hazy air. The pollution is linked to high rates of respiratory illnesses and deaths. But the system of regulation in Mexicali does little to check on what those factories release into the air and water, and does little to punish polluters. Zoe and I spent months reporting in Mexicali and Calexico, focusing on neighborhoods affected by pollution. We interviewed researchers, activists and asthma doctors, as well as residents on both sides of the border who are worried about the health effects of breathing the toxic air. We visited with families who live next to the New River, and people who work as trash pickers in Mexicali’s dumps. We crisscrossed the city chasing the sources of black smoke plumes as trash fires erupted. Our reporting also involved an examination of documents and data obtained from Mexican, U.S. and California government agencies. The data enabled us to look at how air pollution in the Mexicali area, and California neighborhoods just across the border, compare with other cities in California where air pollution is a problem. Analyzing public health data, we found startlingly high rates of deaths from respiratory illnesses in the Mexicali area compared with the state of Baja California and Mexico as a whole. To examine the pollution in the New River, we turned to water testing data from California water regulators and the International Boundary and Water Commission. We found that while sewer upgrades in the 2000s improved the water quality, Mexicali’s sewer system has been deteriorating in recent years and raw sewage spills are again on the rise. We also analyzed government spending figures, which showed that U.S. government spending on jointly funded sewer projects along the border has declined dramatically during the past decade, both in Mexicali and all along the border. The lack of spending means that necessary fixes, which could help clean up the New River and other river, are going largely unfunded. In our reporting in Mexicali, I found that Mexican environmental regulators lack the staff and resources to properly track pollution or verify companies’ self-reported accounts of what they release into the air and water. Officials at Baja California’s Environmental Protection Department have the power to issue big fines – up to the equivalent of about $77,000 – but have been issuing much smaller fines of $6,500 or less during the past two years. In producing the series, Zoe and I collaborated with a team of journalists across the USA TODAY Network to tell these stories through a matrix of experiences — videos, interactive graphics, photography and virtual reality — that help bring the pollution problems into focus. We also included a section on solutions, with a list of 10 ideas that emerged during our reporting for addressing the pollution crisis on the border. If you have ideas about potential solutions, or tips you’d like to share to help us investigate further, please contact @MyDesert, @ZoeKMeyers or me (@BYIanJames). Thank you. Along the U.S.-Mexico border, in an area called Mexicali, the air is killing people. This is how a river along the U.S.-Mexico border became a toxic waste dumping ground. This city's factories make stuff Americans buy. But its people pay a heavy price. A toxic wasteland festers on the border, putting people's health at risk. Ian James is reporter with The Arizona Republic in Phoenix. He wrote the series ‘Poisoned Cities, Deadly Border’ while working for The Desert Sun. Reach him at ian.james@arizonarepublic.com.